Jim (On Monday): What did you do this weekend? Tommy: I went to the beach all day yesterday, and I forgot to put on sunblock. Jim: Uh-oh. Did you get sunburned? Tommy: My shoulders got so roasted that I couldn't even sleep last night. My skin hurts so bad! Jim: Well, I guess next time you won't forget to wear sunblock. Chrissy: Can I borrow some of your sunscreen? Chrissy: I want to make sure my nose doesn't get roasted. 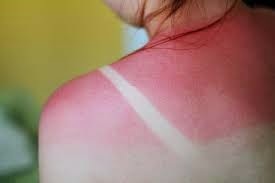 Meaning: "to get roasted" is an American idiom that means to get very sunburned. People use this expression when they get so burned by the sun that their skin hurts.